Apr 21, 2014 - Cheng-Chieh Lin,1,2,3 Chia-Ing Li,2,3 Chiu-Shong Liu,1,2,3. Wen-Yuan Lin,1 ... Ching-Chu Chen,6 Chuan-Wei Yang,3 and Tsai-Chung Li7,8. May 12, 2014 - Components: Taichung Community Health Study. Cheng-Chieh ... 2 School of Medicine, College of Medicine, China Medical University, Taichung 40402, Taiwan ..... betic nephropathy in Pima Indians, individuals with hyper-. manager roles access these objects by using CMIS/P in order to realise management policies. ... boolean expression containing assertions on attribute values. 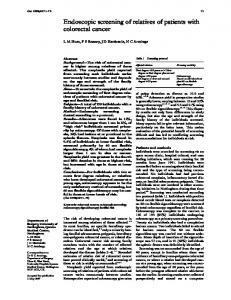 Jul 19, 2005 - specific nonmedullary thyroid cancers through parental and sibling probands. 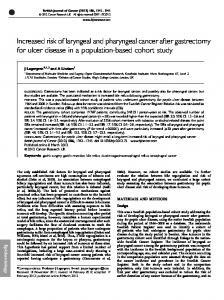 ... Medullary thyroid cancer received a specific code in the. Nov 15, 2018 - Dr. E.F. was supported by a Human. Capital and. Mobility. Research. Training. Programme ...... and. Dr. Barbara. D'Avanzo for scientific advice,. Jun 22, 2009 - also essential for the survival of breast cancer cells.21 Specific knockdown of ... retinoblastoma, soft tissue sarcomas and Paget's disease of the. Kurian et al. Breast Cancer Research 2010, 12:R99 http://breast-cancer-research.com/content/12/6/R99 ... treatment with ER-, PR-, or HER2-targeted therapies). Jul 16, 2015 - Very large fires (VLFs) have important implications for communities, ..... deserts: potential for increased wildfire and invasive annual grasses. septosporum to the Caledonian pine populations of Scotland .... Europe caused by Hymenoscyphus fraxineus has been linked with planting of Asian Fraxinus. AFS POLICY STATEMENT x. Management of Sharks and Their Relatives. (Elasmobranchii). By J. A. Musick, G. Burgess, G. Cailliet, M. Camhi, and S. Fordham. 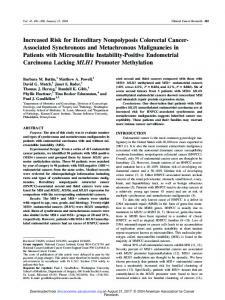 Endoscopic screening of relatives of patients with colorectal cancer. therapy (HRT) and a higher risk of both invasive lobular carcinoma (ILC) and invasive ductalâlobular ..... in situ and sclerosing adenosis (Mendelson et al. 1989,. ... not appear to be more frequent in first degree relatives of women with cervical cancer ... Strong evidence for a genetic link to cervical cancer comes from a large ..... 5: a word processing, database, and statistics program for epidemiology on . Sep 7, 2010 - cancer cases with and without BRCA1 and BRCA2 mutations ... California Cancer Center, Fremont, CA, USA; 6Departments of Molecular Genetics and ...... including Fox Chase Cancer Center (U01 CA69631), Huntsman. Dong and Hemminki, 2001; Hemminki and Granstrom, 2004). There is no consistent evidence for an increased risk of cancer at other specific sites, although some studies found a risk of cancer other than breast cancer (Goldgar et al, 1994; Anderson et al, 2000). We have expanded previous work from an Australian study (Dite et al, 2003) by incorporating data from two further studies carried out in North America. We used data from the Breast Cancer Family Registry (Breast CFR), a large international consortium that has enrolled more than 13 000 breast cancer families (John et al, 2004), to study cancer risks for close relatives of women (index cases) who had very early-onset breast cancer and had been identified through population-based cancer registries, a large proportion of whom had been screened for mutations in BRCA1 and BRCA2. We estimated risks of breast and other cancers for groups of relatives defined by the BRCA1 and/or BRCA2 mutation status of their index case. 1104 San Francisco (USA), Ontario (Canada) and Melbourne and Sydney (Australia) (McCredie et al, 1998; John et al, 2004); see also the Supplementary Material. Index cases were restricted to those diagnosed before the age of 35 years with an incident, first primary breast cancer who self-reported being Caucasian and for whom information on their biological parents and full siblings was available. In San Francisco, 185 (61%) of 301 index cases participated (24 were deceased, 6 had physician-reported contraindications for contact, 1 was too ill, 20 could not be located, 53 declined to participate and 8 did not respond). In Ontario, 226 (62%) of 362 index cases participated (for 19 the treating physician refused permission to contact, for 7 the treating physician could not be located, 4 were deceased, 11 could not be contacted, 30 refused and 65 did not respond). In Melbourne and Sydney, a breakdown of participation for cases diagnosed before age 35 years was not available, but for the 1208 identified index cases under the age of 40 years at diagnosis, 856 (71%) participated (for 102 the treating physician refused permission to contact, for 10 the treating physician did not respond, 19 were deceased, 35 had moved, 168 declined to participate and 18 did not respond). After restricting index cases to those who self-identified as Caucasian and for whom there was cancer history information on their biological parents and siblings, a total of 504 index cases (103 from San Francisco, 124 from Ontario, and 277 from Melbourne and Sydney) were included in this study. Family cancer histories All index cases completed the same Breast CFR family history questionnaire (John et al, 2004) that included an enumeration of at least all first-degree relatives and information on known cancer histories. Recruitment of living parents and adult siblings of the index cases was sought wherever possible. Participating relatives then provided cancer history information regarding themselves and their relatives. A substantial proportion of the information collected for first-degree relatives was provided independently by the relatives themselves. Documented verification of reported cancers (through pathology reports, cancer registries and medical records) was sought wherever possible. Overall, 50% of reported cancers were verified, 63% of breast cancers and 43% of non-breast cancers. Nonmelanoma skin cancers were excluded from analyses. All participants provided written informed consent before participation and all studies were approved by the relevant local ethics committees. Imputation of missing family data For each index case, the data required on each of their parents and siblings for these analyses were: relationship to the index case, date of birth, vital status, age at interview or death, and for those who had had cancer, the site and age at diagnosis. For some relatives, one or more of the above data items were missing and could not be calculated directly from known data. A total of 48 relatives had missing date of birth, 3 deceased relatives had missing age at death and 13 with cancer had missing age at diagnosis. In these instances, data were imputed iteratively using a variation of a previously developed protocol (Dite et al, 2003); see Supplementary Material for more details. A further 10 had missing vital status and were censored at age 20. To estimate the number of index case mutation carriers not identified by testing, we multiplied the number tested by each method by 1 – proportion of the coding region of the gene covered (0.9 for sequencing, two-dimensional gel electrophoresis and heteroduplex; 0.8 for whole gene PTT; 0.6 for limited gene PTT; and 0.1 for founder mutation screening) and multiplied by the mutation frequency (0.15 and 0.05 for those with and without an affected first-degree relative, respectively). For index cases for whom no testing was conducted, the number of missed mutations was estimated by multiplying the number not tested by the mutation frequency above. Of the 374 tested index cases for whom no mutation was found, we estimated that 4.7 BRCA1 and 7.3 BRCA2 carriers were not detected. Of the 89 index cases not tested, we estimated there were 5.3 BRCA1 and 5.6 BRCA2 carriers not detected. Therefore, we estimated that 5% of the index cases not tested, or found not to carry a mutation, were carriers. Cancer incidence For each cancer site, population-based cancer incidence rates specific for age (in 5-year groupings), year of birth (in 5-year groupings), gender and country were obtained for: 1925 – 1985 in Connecticut, USA (http://seer.cancer.gov); for 1965 – 2001 in Ontario, Canada (Ontario Cancer Registry, 2004); and for 1983 – 2001 in Australia (http://www.aihw.gov.au). For Ontario and Australia, cancer incidences were not available before 1965 and 1983, respectively. These incidences were extrapolated from the available data by calculating the known Ontario and Australian incidences as a proportion of the Connecticut rates and applying this proportion to the Connecticut data for the missing years. Specific cancer sites chosen for inclusion in this study were those which are known to be common (colorectal, brain, cervix, lung, stomach, urinary) and/or of particular interest in relation to breast cancer (ovary, prostate). Urinary cancers were defined as cancers of the kidney, bladder, ureter and renal pelvis. Statistical methods We estimated the standardised incidence ratio (SIR) by comparing the observed number of affected in a group of relatives to those expected in the general population. The age-specific cumulative cancer incidence was estimated by Kaplan – Meier product-limit survival functions in which failure time was age at cancer diagnosis. Unaffected relatives were censored at age at completion of family history questionnaire if alive, age at death if deceased or age 20 years if vital status was unknown. Cumulative incidence was defined as the complement of the Kaplan – Meier survival function. All statistical analyses were performed with STATA version 9, (2005) (Stata Corporation, College Station, TX, USA). All statistical tests were two-sided and, following convention, P-values o0.05 were considered nominally statistically significant. In mothers or sisters of the index case. bOne index case had mutations in both BRCA1 and BRCA2. Abbreviations: CI ¼ confidence interval; SIR ¼ standardised incidence ratio. 7.51 (95% CI 2.42 – 23.29), respectively, whereas for relatives of index cases who were not found to be a carrier or had not been tested, the SIRs were 2.58 (95% CI 1.71 – 3.88) and 2.62 (95% CI 1.09 – 6.28), respectively. Table 3 shows that the SIRs for all non-breast cancers (excluding non-melanoma skin cancer) were elevated both overall and for each of the subgroups, for brothers, the subgroup with the least observed cancers, the SIR was only marginally elevated. The SIR for cancers other than breast cancer for fathers and brothers combined was not different to that for mothers and sisters combined (P ¼ 0.5). The SIR for brothers and sisters combined was 1.6 times that for fathers and mothers combined (P ¼ 0.03). For the male relatives, the SIR for fathers was not different to that for brothers (P ¼ 0.9), whereas for female relatives the SIR for sisters was 2.5 times that for mothers (Po0.01). For subgroups defined by mutation status of the index case, the non-breast cancers SIR for relatives of the index cases who carried BRCA1 mutations was marginally elevated while the SIR for relatives of the index cases who carried BRCA2 mutations was not elevated. Elevated SIRs were seen for relatives of index cases who had been tested and found not to be a carrier or were untested. After limiting analyses to relatives of the index cases not found to carry mutations, the SIRs remained elevated for all subgroups except for brothers and marginally so for mothers. The SIR for brothers and sisters combined was higher than for fathers and mothers combined (P ¼ 0.03) and the SIR for sisters remained higher than that for mothers (Po0.01). Table 4 shows cancer site-specific SIRs. The ovarian cancer SIR was elevated overall (2.46; 95% CI 1.23 – 4.92; P ¼ 0.01) and for mothers and sisters of BRCA1 mutation carriers (Po0.001), but not for mothers and sisters of index cases who tested negative or were not tested; see also Figure 2. No ovarian cancers were observed in relatives of BRCA2 mutation carriers. For prostate cancer, the SIR was substantially elevated overall (6.54; 95% CI 3.71 – 11.51; Po0.001) and within subgroups defined by BRCA2 mutation carrier and testing status (all Po0.001). No prostate cancers were observed in relatives of BRCA1 mutation carriers. Using the eight verified prostate cancers only, the SIRs for fathers and brothers remained elevated and were 4.36 (95% CI 2.18 – 8.72) overall and 3.75 (95% CI 1.56 – 9.01) for relatives of known non-carriers (both Po0.001). For brain cancer, the SIR was elevated overall (2.79; 85% CI 1.26 – 6.22; P ¼ 0.01) and for the subset of relatives of known noncarriers (both P ¼ 0.01). No relatives of known BRCA1 or BRCA2 carriers were diagnosed with brain cancer. When analyses were restricted to using the four verified brain cancers, the SIRs for relatives of known non-carriers of 1.86 (95% CI 0.70 – 4.96) overall and 2.34 (95% CI 0.88 – 6.24) were greater than unity but not significant. 1106 For lung cancer, the SIR was elevated overall (7.04; 95% CI 4.54 – 10.91; Po0.001) and for relatives of index cases who were not tested or known not to be carriers (P ¼ 0.05 and Po0.001, respectively), and for the latter group the SIRs of 5.22 (95% CI 2.72 – 10.03) for males and 20.34 (95% CI 9.70 – 42.66) for females were different (P ¼ 0.007). The SIRs for relatives of BRCA1 and BRCA2 carriers were not elevated. When restricted to the seven verified lung cancers, the SIR was elevated overall (SIR ¼ 2.46; 95% CI 1.17 – 5.17; P ¼ 0.02), and for males (SIR ¼ 2.52; 95% CI 1.13 – 5.62); P ¼ 0.02). Abbreviations: CI ¼ confidence interval; SIR ¼ standardised incidence ratio. aExcludes non-melanoma skin cancer. Figure 2 Cumulative risk of ovarian cancer for mothers and sisters combined. 1108 then the increased breast cancer risk seen in the restricted analysis would predict that we have slightly over-estimated the true breast cancer risk for relatives of non-carriers. This is unlikely to explain the increased cancer risks seen in the restricted analyses. Our results provide evidence for the existence of familial factors, such as variants in genes other than BRCA1 and BRCA2, which contribute to the increased risks for breast, prostate, lung and/or brain cancers in relatives of women with very early-onset breast cancer. This has implications for gene discovery by focussing attention on families known not to be segregating BRCA1 or BRCA2 mutations with one or more breast cancers diagnosed at a young age as well as one or more of the above cancers. This approach would be similar to those that had pivotal roles in localising BRCA1 through using breast – ovary cancer families (Easton et al, 1993), and cloning BRCA2 through studying breast cancer families with male breast cancer (Wooster et al, 1995). CA69398), Northern California Cancer Center (U01 CA69417), Cancer Care Ontario (U01 CA69467) and The University of Melbourne (U01 CA69638). The Australian Breast Cancer Family Study was also supported by the National Health and Medical Research Council (NHMRC) of Australia, the New South Wales Cancer Council and the Victorian Health Promotion Foundation. The content of this paper does not necessarily reflect the views or policies of the National Cancer Institute or any of the collaborating centres in the Breast CFR, nor does mention of trade names, commercial products or organisations imply endorsement by the US Government or the Breast CFR. JLH is an Australia Fellow of the NHMRC and a Victorian Breast Cancer Research Consortium (VBCRC) Group Leader. MCS is a Research Fellow of the NHMRC and a VBCRC Group Leader. We thank the participants in the Breast CFR and the Ontario Familial Breast Cancer Registry. We also thank Gord Glendon, Hilmi Ozcelik and members of the Ontario Cancer Genetics Network for their contributions to the study. Report "Increased cancer risks for relatives of very early-onset ... - CiteSeerX"